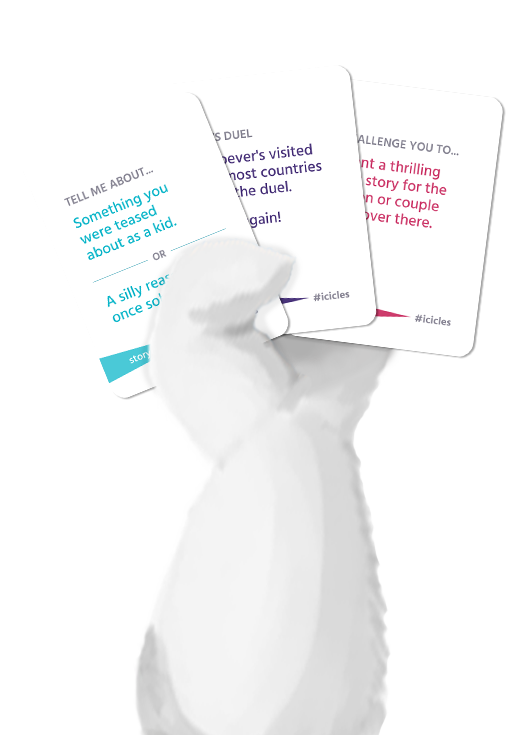 Introducing ICICLES, a card game on a keyring for great dates! Fits in your purse or pocket, play it in a coffee shop, bar, or Uber! Break the ice with ICICLES, a card game on a keyring for great dates! "Just plain fun, no matter where you are, in the world, or in your relationship"
Flip to a random card on the ring. There are story cards, challenge cards, and duel cards. Read the card to your date. If it's a story card, pick the option you like best for them. If your date declines, you can steal the card; if they complete the card, they win the round. Now it's their turn to read a card for you! You can keep track of points or, like most people, play ICICLES as a casual ice breaker. ICICLES the answer to the grind of app-based dating. It is guaranteed to make your dating life more spontaneous, playful, and insightful! An extra, free copy of the Silver edition! I'm in a deeply committed, spiritually satisfying relationship. Can I play ICICLES? First, stop bragging. Second, yes! Many of our customers are couples. It will reveal new insights about your partner and freshen up your otherwise stale dates. Plus, when you're done, you can donate it to your jealous single friends. My daughter needs to find a nice man. We agree! Buy her a copy of ICICLES and you'll have grandkids in no time! My mom needs to stop butting in on my social life. True, but if she bought you a copy of ICICLES, it means she loves you! 54 beautiful cards on a high-quality, metal keyring. Where can I play ICICLES? The game's unique keyring design allows play without table space. Play it in a bar, coffee shop, restaurant, or Uber! Should I buy the silver edition or the gold edition? Buy the more expensive one, because we want your money! Also, the gold edition is sturdier and the linen finish looks very elegant. And it's still less than what you paid to go on that last, truly awful date. Help! I broke my keyring. Send us a pic and we'll mail you a replacement right away. Help! I have no friends and no dating prospects! Buy 50 copies of ICICLES and head to hippest bar in town. You'll have 49 new friends and a fiance by the time you leave! Is the polar bear single? No, but the person wearing the costume might be. Yes! It's been tested on dozens of dates with a 100% success rate. If you play ICICLES and the date doesn't go well, it means that your date is a creep and you should get out of there ASAP. Is this like those 36 questions that make you fall in love? Yes! But instead of skipping to love on the first date, we get you to laughter and like. Other than ICICLES, how else can I impress my date? Make your date a homemade cocktail, download our award-winning first game, Nimble Strong: Bartender in Training, on your iPhone or Android to learn how! ICICLES was co-created by former co-workers Adam Ghahramani and Tiffany Wong in New York City. We were also helped immensely by the talented illustrator Lauren Epps, as well as Brian Hourigan and the entire cast and crew of the video shoot! Can I sell ICICLES at my store? For bulk orders or partnerships, send us an email! I'm famous on the Internet and want to write/blog/talk/insta/snapchat/tweet about ICICLES! ICICLES is copyright 2019, Velegant, Inc. All rights reserved.